When you work with Pro Exteriors, you’re getting three generations of expertise, quality, and outstanding service to bring your dream home to life. No matter the scope of your project, you can trust that we’ll take care of your property like it’s ours, delivering top-notch results to guarantee you make the most of your investment and enjoy your home for the years to come. Pro Exteriors is primarily known for our roofing expertise but we’ve made it our business to take care of all exterior needs our customers might have. Whether you require new windows or siding or are considering adding a deck to your property, we have top-quality products and services to address your needs perfectly. Need help financing your home improvement project? Don’t hesitate to ask us for assistance! Just because you need to work with a budget doesn’t mean you have to put your home improvement plans on the back burner. We at Pro Exteriors know this is important to you so we want to make sure you have what you need to see it through, teaming up with Wells Fargo to offer financing options with convenient applications and quick credit decisions. 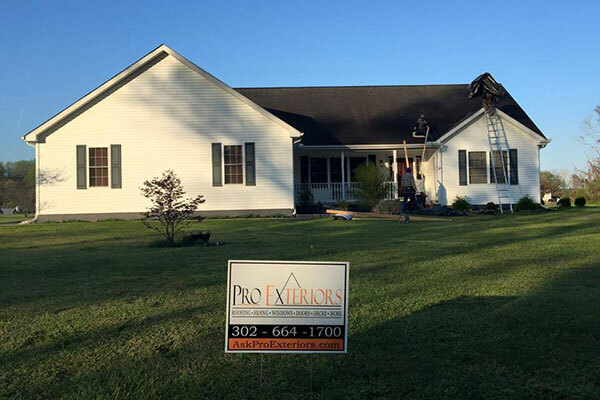 For more than 15 years, Pro Exteriors has been committed to ensuring customer satisfaction, providing unbeatable quality and service to become the preferred choice for home exterior improvement in Delaware’s and Maryland’s Eastern Shore.